There's a conversation happening that should prove interesting to online advertisers - viewability as an ad performance metric. Google describes viewability rate as the, "Percentage of ads determined viewable out of the total number of ads measured." According to this infographic, the most viewable position is right above the fold, not at the top of the page. The IAB has been quick to call 2015 a "year of transition," as it expects agencies, publishers, marketers and advertising technology companies to work together to assure the new currency of "viewability" (rather than "audience currency") can be implemented by all companies in the digital advertising ecosystem. 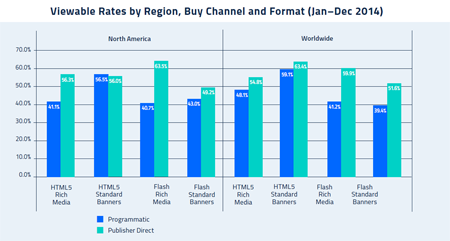 The IAB's "State of Viewability Transaction 2015" serves as a starting point for advertisers looking for more information about viewability and the industry standards in which IAB is setting. 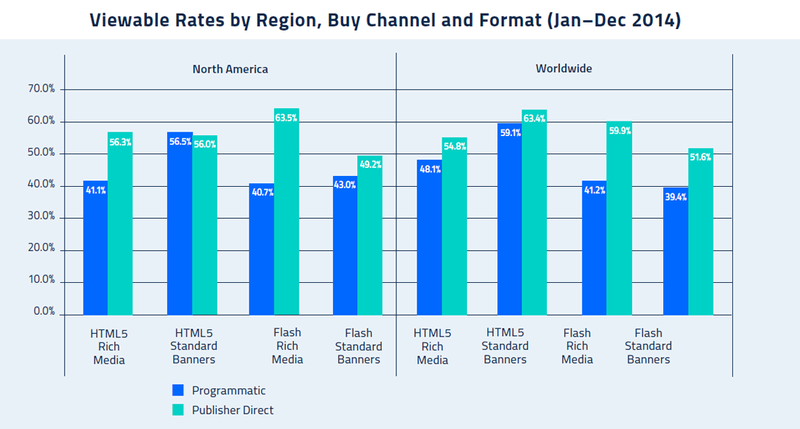 Taking this report a step further, Sizmek, an open ad management company for multiscreen campaigns, recently released its "Viewability Benchmark Report, Winter 2015." The study, conducted by Sizmek Research, analyzed viewability data from more than 240 billion measured impressions in 2014 to identify trends related to the newly defined ad performance metric. The most significant finding is that Sizmek's research confirmed the IAB's recommendation of using a threshold of 70 percent of impressions across the campaign to meet the viewability standard – to be a reliable benchmark for ad performance. Further, this means that of all measured impressions – those that could be measured by a vendor’s tools – 70 percent of those campaigns’ impressions should meet the minimum standard viewability rate of 50 percent of the ad in view for at least one second.